Almost every gamer I’ve met has come up with an idea for a new game. But that moment of bright inspiration is often followed by a thick fog of questions: What game mechanics do I use? Who will playtest my game? How do I balance my game? Where can I get a prototype made? There may be a variety of questions that accompany your first game design but getting answers is not as difficult as you think. Starting your first game design is really just a matter of knowing your resources and how to use them. If you take only one tip in this article, let it be this one. As a designer, your network of other designers is your greatest resource. Game design is a naturally collaborative effort. You’ll need the help of many other people in all kinds of tasks, from playtesting to rulebook editing. More importantly, you’ll need trusted advisors whenever you get stuck. So find other designers as soon as possible. Finding other designers is simpler than you think. If you live in or near a big city, there’s likely a group of designers who meet monthly somewhere near you. They can be found using Meetup or Facebook. You can also check with local boardgame groups. Chances are someone knows someone who likes to design games. If your search comes up short, you can also look for Protospiels and Unpubs that take place near you. 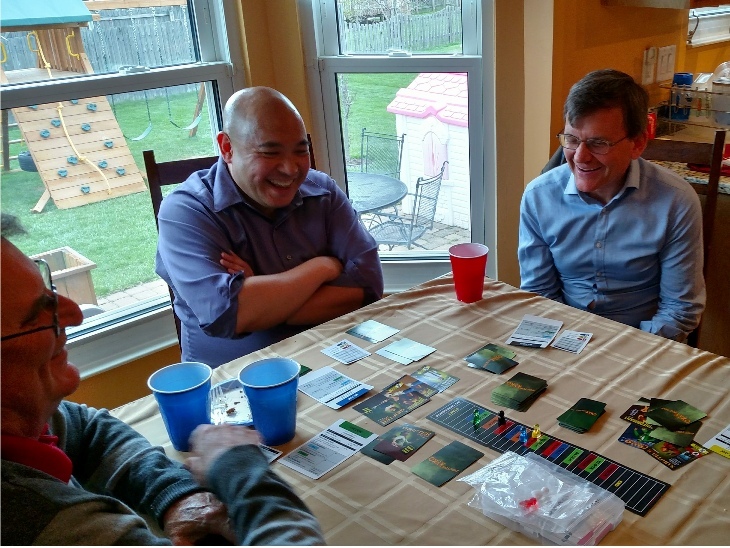 Protospiels and Unpubs are annual gatherings of game designers who playtest each others’ games over a weekend. You can find the nearest events by going to their websites. 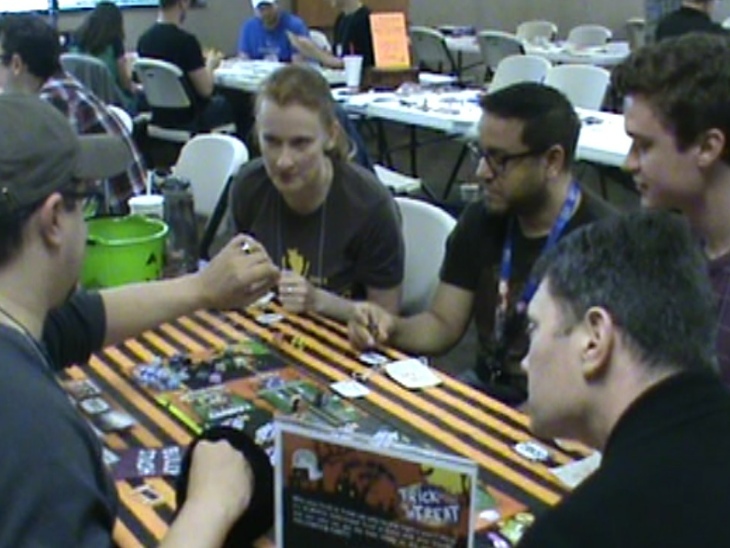 A local game convention, even a small one, may set aside space for playtesting. This is a great place to meet other designers. The easiest way to find out if a convention has a playtest area is to contact the convention organizers. Using slips of paper and cardboard for your prototype is absolutely fine. But if you’re like me, you’ll want to create a “polished” prototype when you’re ready for public playtesting. Luckily, there are several “Print on Demand” websites that allow you to create a very professional-looking prototype such as The Game Crafter, Print and Play Games, and Board Games Maker. Each website has a slightly different process to produce prototypes but you basically upload the art to the websites and tell them what you want the art printed on such as cards or game boards. Additionally, most websites offer generic game components like dice, player tokens, and even miniatures that you can order along with your customized components. Some services may take a couple of weeks to produce and deliver your order; others can get you a prototype in a couple of days. In either case, most offer some kind of rush service for an extra charge if you need a quick turnaround for a prototype. As a game designer, you’ve probably already played all kinds of games. Keep doing that. Playing a lot of games is the best way to understand which game mechanics you like or don’t like and how they work best. For your first game design, I would recommend playing games that are similar to the types of games you would like to make. For me, I like to make light, casual, gateway, and “beer and pretzels” games. So I focus on those types of games rather than on party games or heavy Euros. However, eventually you’ll want to branch out into other games to broaden your knowledge of game mechanics. Facebook is the best way to get the early word on designer-related events, such as design seminars and game design contests, as well as resources like companies offering new services. Discussions on Facebook will also provide insight on current trends and best practices. You can even find publishers looking for new game designs on Facebook.. There are several game design Facebook groups but I highly recommend joining the “Card and Board Game Designers’ Guild” group. This is probably one of the largest Facebook groups dedicated to game design discussions. It is run by James Mathe, a game designer, publisher, and one of the most prolific bloggers on game design in the community. If you’re an analytical person like me, you’re looking for a good reference book to help you with game design. There are several very good books on the market and many of them can be found at your local bookstore or on Amazon, but my personal two favorites are “The Game Inventor’s Guidebook” by Brian Tinsman and “The Art of Game Design” by Jesse Schell. Tinsman’s book gives a broad overview of terms, trends, and the gaming industry as a whole. Schell’s book provides great in-depth explanations of game mechanics and the design process. Game design is a long process, often taking months of work to get from concept to complete prototype. The last thing you want to do is “reinvent the wheel” every few months. Using a journal to keep track of your goals, inspirations, and decisions is the best way to know you are making progress with your design. The journal doesn’t need to be anything fancy. It can be a generic spiral notebook, a graph paper notebook (which is great if you’re a visual thinker), or even an electronic notebook on your smartphone. I tend to prefer medium-sized notebooks (smaller than a standard 8.5”x11” notebook) because they are easy to quickly toss in backpack. But I’ve also seen designers carry notebooks small enough to fit inside their pockets. Basically, choose any size or type of notebook you wish just make sure it’s convenient so you actually use it. Now that you’ve got your network, a journal, and other resources, it’s time to actually get started on the game design process. Luckily Art Franz wrote a great article called “Game Design: Moving Quickly From Spark to Playable Prototype.” I highly recommend reading it. 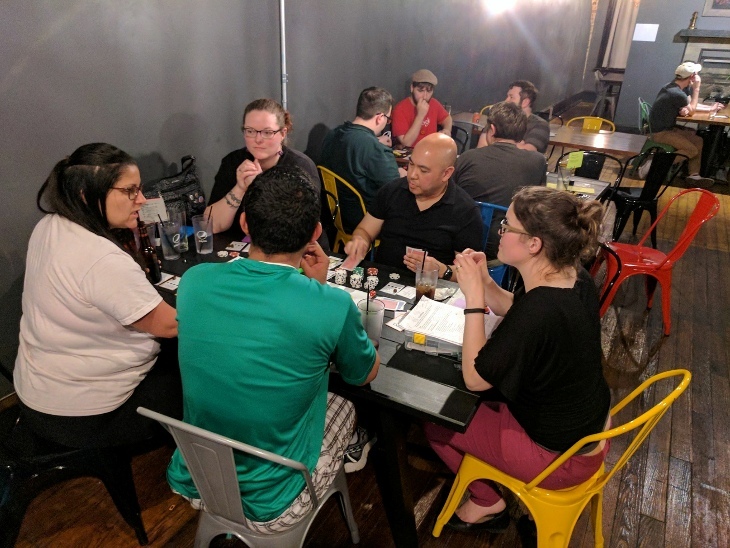 Retired Air Force Major, Aerospace Engineer, Salsa Dancer and Instructor, Married 11 years with 2 kids, Owner of GCRS Games - I love playing and designing board games and talking to other people who play and/or design board games. Thank You Gary. This is a great article with solid advice and useful links and information. I really appreciate your comments on building a good network as well as instructions on how to go from pieces of paper to prototype. Very Helpful !! Great! Easy Actionable ideas. Thanks!!! I’m sorry we haven’t met yet. I’ll be reaching out soon relative to your first recommendation.